It seems like everyone I know has managed to already get a cold (or something worse) this winter. Mine hit me like a wrecking ball the day after Christmas, and a few days after, two of my friends came down the bug. Naturally, my boyfriend followed with a cold of his own just a few days later…and so began the cycle of winter colds in my life. When you’re sick, nothing beats being curled up in blankets to binge-watch your favorite Netflix show between sips of NyQuil. There are also a number of cocktails that can help you power through. 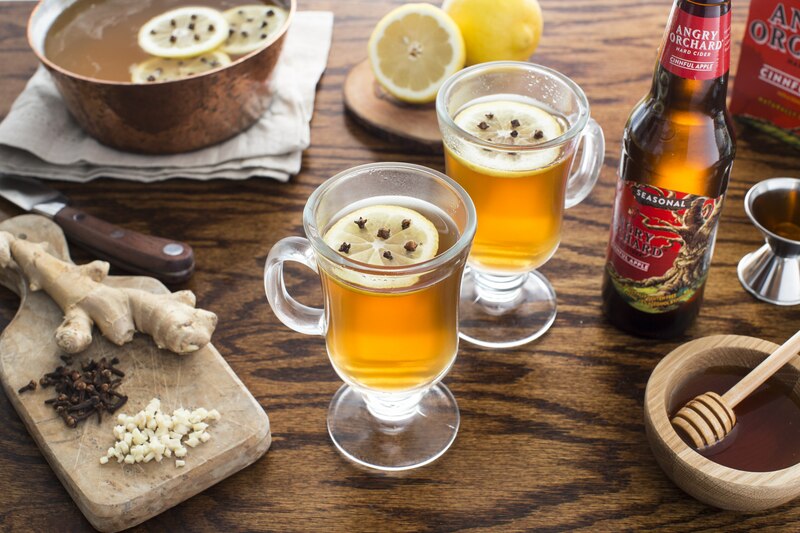 The Hot Toddy has long been touted for its ability to help you fight colds and ease the pain of sore thoughts. If congestion is your issue, then a spicy cocktail can also be a welcome relief. Making a drink with a pepper vodka, for instance, can help clear out congestion (and be a tasty treat to boot). If you or a loved one is suffering from a 2017 cold (or a 2016 one that just won’t go away), here are a few cocktail ideas that can help you power through to recovery. Directions: Coat the bottom of a mug or an Irish coffee glass with honey. Add Dewar’s and the lemon juice. On the side, heat water in a tea kettle and add the tea bag to make hot tea. Pour the hot tea into the glass and stir. Directions: Shake with ice and strain into rocks glass. Garnish with bell pepper and a pinch of mint. Directions: Add all ingredients to a slow cooker and set at low heat. Allow to heat up and then serve and garnish with a lemon wheel studded with cloves. If using a stovetop, add all ingredients to a small saucepan and simmer over low heat. Be careful not to allow the mixture to get too hot because the alcohol will boil off. Directions: Add all ingredients to a rocks glass and stir. Add ice. Garnish with pickled jalapeño slice. Directions: Squeeze lemon in bottom of mug. Add tea and Winter Jack. Stir in maple syrup and top with shipped cream. Directions: Shake and pour over ice. Garnish with a fresh jalapeño. Directions: Shake all together and pour up in a martini glass with one or three olives – two is bad luck! Emily is Paste’s Assistant Drink Editor and can’t wait until cold season is officially over. You can follow her on Twitter @emily.